Each segment shops at nearly the same number of retail and online outlets, yet there is a marked difference in the mix of outlets they regularly visit.The Double-Dippers shop at the largest number of outlets – 7.6 on average, and are the main segment in nearly every major outlet. Three notable exceptions are Wal-Mart, Amazon, and eBay, where this group actually has a lower share of its members shopping there than any other segment. Interestingly, among the Converted segment, two of these three outlets are the strongest. 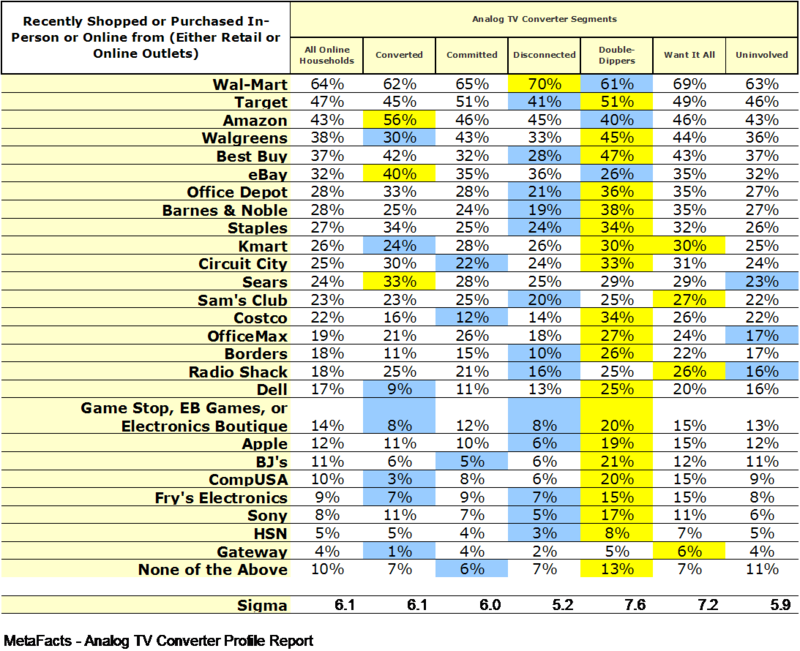 Amazon and eBay have higher shares of the Converted shoppers along with Sears. This segment is the lowest in consumer electronics stores such as Fry’s, CompUSA, and Game Stop/Electronics Boutique. The Disconnected – those households without Pay TV and without an Analog TV Converter – are the lightest shoppers. They shop on average at 5.2 of the major outlets. Their numbers are disproportionately low in nearly half of the outlets on the survey – 13 out of 27. Among those households planning to buy an Analog TV Converter, the top 5 outlets they frequent for any products are Wal-Mart, Amazon, eBay, Target, and Walgreens. All of these outlets offer Analog TV Converters.